Good pants, on time, cheaper than at least one other source. Thanks. The items that I ordered arrived on time and were good quality garments. The product was very attractive and made of quality material, but, the tailoring was shaped to a barrel, and therefore was ill fitting. You did accept the return item graciously and with complete courtesy. I thank you, and will definitely try again. Exactly as advertised and I love my watch. found exactly what i wanted. i do theater in Boston. Will use you again I'm sure. I was not pleased with the quality of the hat I purchased. I thought it would be of a bit better quality but this is more costume quality. The vest I bought was beautiful and well-made. When I ordered the wrong size, exchanging for a longer size was easy and painless. If I had one complaint it was merely that I'd have preferred if the vest was of thicker material--a minor quibble and one easily overlooked. I would recommend the Emporium very highly to anyone looking for quality service and excellent period clothing! I was very happy with the men's clothes and the blouse. The skirt is very simple but it will do. Thank you. Arrived quickly, well packed and exactly as pictured. Most of your products are pretty much historically accurate. I would have liked a choice of chains for the pocket watch and authentic ties instead of the pre-made ones. Otherwise, the clothing is high quality and fun to wear! The service was great fast shipping etc and I love your products. However, on the last coat I ordered the top button was not lined up with the hole so that when it is buttoned up there is a small wrinkle. It is not a huge deal but I noticed it after I had already worn it out so I could not exchange it. I realize these things happen and I will continue to buy from your store. You have a good selection of products and a user friendly web site. I enjoy logging on and looking at other items i plan to purchase. Whatever I ordered, as I have made several, they came promptly and were exactly what I was told they would be. Also the sizing guide really helped out a lot. Thank you guys a million! Great items. Authentic and good quality. You were great! You filled my order promptly and allowed me a return for size and color change without any problems. Your customer service is excellent! The product was quite nice in quality, but much too small. I ordered a hat which was not offered in more than one size. Every woman I asked to try it on said it was much too small. I feel your sizing standards might require a revision. I now have a hat I cannot wear unless I devise some way to stretch it without ruining it. Exactly what I ordered in a timely manner. Great products...can't find ANYWHERE else! Loved your web site. Very happy with my purchase. Customer service was excellent! My son is delighted with his goggles. Thank you! I already have, this is the best price I've found on the things that I want, and I'm dragging my friends into the steampunk subculture kicking and screaming. My order was completed very quickly, it was exactly what I ordered and it lived up to its description perfectly. Very pleased with the quality of products. It would depend upon what a friend or colleague needed and if they felt comfortable purchasing it online. Completely satisfied with the products received & in the short time it took to receive them. Great selection of quality stuff from an era we love dressing like! Plus I love the the pre-compiled outfits and descriptions of the types of people who might wear such an outfit. The items I find are excellent. If I don't order right away and get put on backorder, I understand. The service was prompt and I appreciate being contacted by e-mail when the ordered item was put on backorder. The estimated date gave me a good idea of how long a wait I was in for, and to my surprise it shipped early! Thnx! 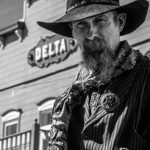 I've always found your site to be an excellent source for basic victorian/ Western wear! VERY NICE AND PROMPT SERVICE!! The parasol was smaller than I expected, but the other clothing items on the site looked fantastic and I am not only like to purchase from the site again, but to recommend it to others. I can't say more but this: great stuff and fantastic service! I ordered from germany and was happy as a child when I got my package just a few weeks after the confirmation. The clothes are stunning. I want to replace my whole wardrobe what acutally means, that I will contact you guys in the next months for more stuff ;-) . Greetings from germany. I very much like what I received. Very pleased with both service and quality of products. Despite not having any sort of customer account interface, your company both processed and delivered my order without error. Excellent products, outstanding customer service. You were great!! The coat I ordered my daughter was the wrong size and your exchange was painless and prompt.I called and spoke with someone at Western Emporium and they were very pleasant and helpful. Thanks! I was pleased with my purchase. The quality of the merchandise is very good. I have in fact recommened your sites to several people already. I love the vest and the service was fast and very well done. The product was lovely, but not very durable. It broke on the first use. The vest I bought fit and looked fine after my wife put a couple of stitches at the bottom of the lapel. It didn't want to lay down after it was buttoned. Although the order was very prompt the item was broken and I had to return it for replacement. I haven't been able to figure out if GE has credited me for the postage it cost to send the item back. I just wanted a gift box- they couldn't help! shipping took a lomg time. I compared prices and selections and liked what you offered in both categories. It took 3 shipments before I actually got what I ordered. The size was incorrect. I wrote a note and returned the hat. I received another hat the incorrect size. Finally on the 3rd shipment, I received the hat size I had ordered. It is very nice and meets my expectations. They need to be more attentive to their curstomer' s instructions and or questions. Taking 3 times to get a simple hat correct is pretty lame. I like their quality and probably will order some more things from them. They were pleasant on the phone. I loved, loved, loved my new duds from Historical Emporium. In fact, I'm thinking of giving my manicurist (who is also my friend) a birthday present from Historical Emporium. For my own order, at first it started out looking at the DVD of Roy Orbison's Black and White Night. I loved his outfit and thought my boyfriend would like that look and decided to give him a Christmas present. Turns out my boyfriend said he didn't want to look like a cowboy. He's more of the Jersey boy type. However, when I saw the items, I decided I wanted to look like a cowboy and exchanged everything in my own size. Don't get me wrong, I'm not into men's clothing usually, but the look was so cute and different and harmless that I decided to keep the items (in my own size) for myself!..........and I LOVE them! Now I'll be picking out something cute for my manicurist. She's often told me she feels in a past lifetime that she lived in the Wild West!